SAN FRANCISCO, California, September 14, 2010 (ENS) – From foxes to whales to walruses to plankton, Arctic species are being pushed toward extinction by rapid climate change, finds a new report by two conservation groups. In a report released Monday, the Center for Biological Diversity and Care for the Wild International document the situations of 17 Arctic animals trying to survive the effects of climate change and ocean acidification. Most of the 17 imperiled species are mammals – the Arctic fox, polar bear, caribou or reindeer, muskox, and Pacific walrus, as well as four whales – gray, beluga, bowhead and narwhal. 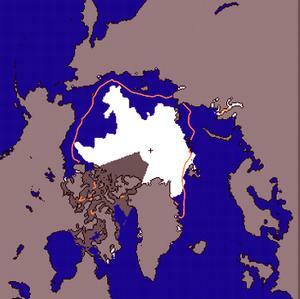 Four ice seals are also at risk – the ringed, bearded, harp and ribbon seals. The report names three seabirds in jeopardy – the Kittlitz’s murrelet, spectacled eider and ivory gull; and also finds the sea butterfly, a species of plankton, to be at risk of extinction. The minimum extent of Arctic sea is is smaller than ever, satellite data shows. Arctic sea ice generally reaches its annual minimum extent in mid-September. On September 3, ice extent dropped below the seasonal minimum for 2009 to become the third lowest in the satellite record, according to the National Snow and Ice Data Center at the University of Colorado, Boulder. This August, ice extent for the month was the second lowest in the satellite record, after 2007. According to NASA scientists in the Cryospheric Sciences Branch, a satellite-based data record starting in late 1978 shows that indeed rapid changes have been occurring in the Arctic, where the perennial ice cover has been declining at the rate of about 13 percent per decade and the ice cover as a whole has been declining at the lesser rate of about five percent per decade. This year, the Northwest Passage and the Northern Sea Route are largely free of ice, allowing the potential for a first circumnavigation of the Arctic Ocean now being attempted by two expeditions – one from Norway and one from Russia. 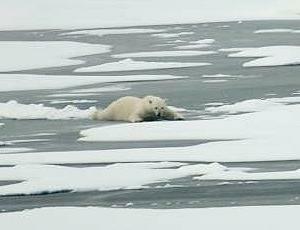 The conservation groups say this rapid disappearance and thinning of the sea ice is having devastating effects on the many species that depend on it for rearing young, hunting, resting and avoiding predators. Some Arctic species have already experienced widespread die-offs and population declines after losing key habitats and food sources, the groups report. Others face extreme weather events or suffer new pressure from predators and pathogens moving northward. Sea ice loss is forcing Pacific walrus mothers and calves to come to shore, where young can be trampled to death in stampedes. Researchers from the U.S. Geological Survey’s Alaska Science Center, who have been tracking walrus movements using satellite radio tags, report that up to 20,000 walruses are now gathering in herds on the Alaskan side of the Chukchi Sea. “For the third time in the last four years, thousands of Pacific walruses are hauling out onto the northwest shores of Alaska to rest in the absence of sea ice over the continental shelf of the Chukchi Sea,” the USGS research team said August 30. In February 2008 the Center for Biological Diversity filed a formal scientific petition with the U.S. 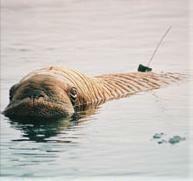 Fish and Wildlife Service requesting protection of the Pacific walrus under the Endangered Species Act. Under a lawsuit settlement, the Service must make a decision as to whether the species should be protected by January 31, 2011. Early sea-ice breakup prematurely separates ringed and harp seal mothers from their pups before the pups are big enough to survive, the conservation groups report. Meanwhile, the warming Arctic is still putting polar bears at risk. Eight of the world’s 19 polar bear populations are declining as they struggle to raise young and hunt for food on shrinking ice sheets. 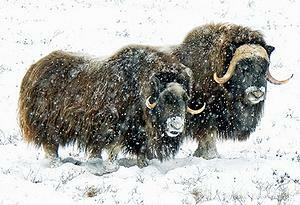 On land, tundra habitat is moving northward, thawing permafrost threatens to drain wetlands, and extreme winter weather events are causing die-offs of Arctic grazers like muskoxen that are prevented from reaching their food. The Arctic fox is disappearing from the southern edge of the tundra as larger, more dominant red foxes move northward and lemming prey grow less abundant as temperatures warm. Tundra dwellers like the caribou and muskox are being affected by warmer spring temperatures that alter food abundance, as well as extreme winter weather events leaving dense snow and ice crusts that obstruct their access to food, the groups report. 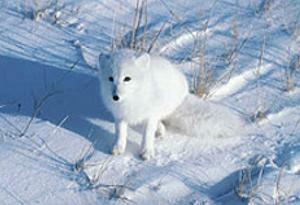 Lives of the Arctic’s smallest creatures as well as the largest are being disrupted by climate warming. The oceans have absorbed more than a quarter of all of human carbon dioxide emissions – generated by burning coal, oil and natural gas. The addition of this vast quantity of CO2 is changing the chemistry of ocean water, turning it more acidic, scientists around the world have documented. The Arctic Ocean is becoming corrosive to shell-building creatures like plankton and clams more quickly than temperate waters. “It could become lethal to the most sensitive shell-builders by 2050, threatening the marine ecosystem with collapse,” the groups state in their report. 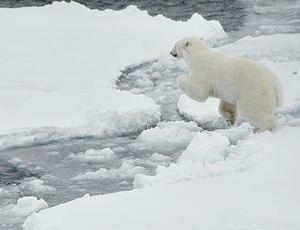 The report concludes that science-based actions are urgently needed to protect Arctic wildlife. Atmospheric CO2 must be reduced from its current level of 390 parts per million to, at most, 325 to 350 ppm to avoid catastrophic impacts from climate change and ocean acidification, and to restore Arctic sea ice to the size it was 25 years ago, the conservationists advise. To protect Arctic species, the groups urge the curbing of powerful, short-lived greenhouse pollutants like black carbon and methane, the prevention of new oil and gas development in the Arctic, and the reduction of threats to Arctic wildlife from overhunting and contaminants.